In many games it is important to be able to detect when certain game objects collide with eacher other. 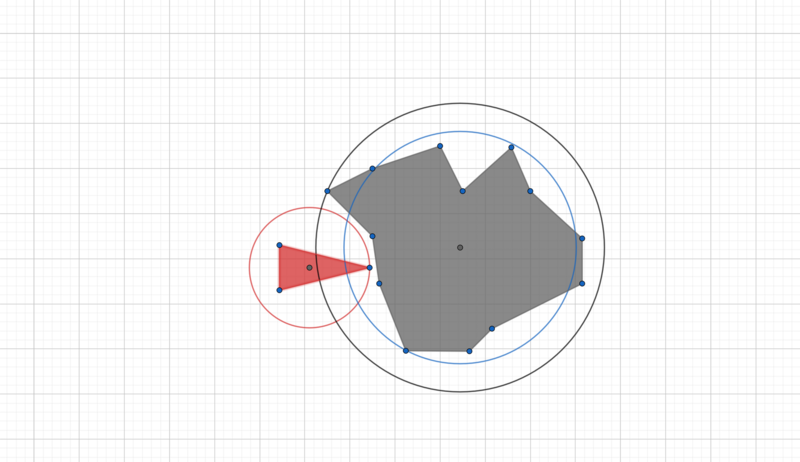 In this tutorial we will learn two different ways to tackle the collision detection problem with polygonal objects. Bounding Spheres computed using the largest distance from the centroid of the polygon to each of the vertices. 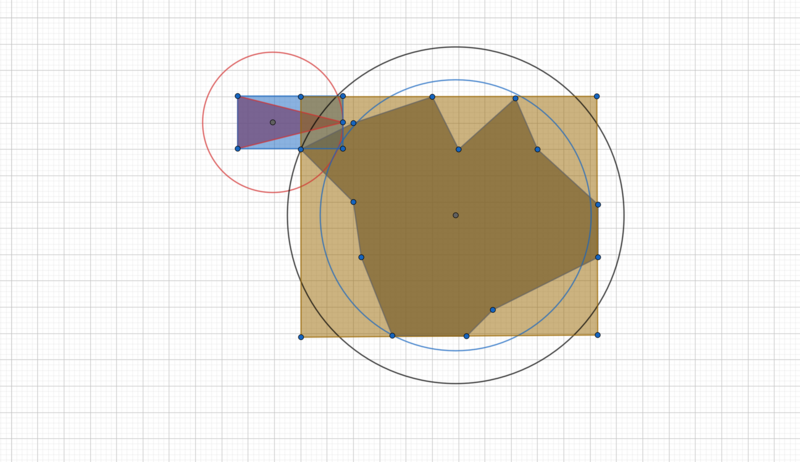 To implement a bounding sphere algorithm, it is thus necessary to be able to compute the centroid of a polygon. Read the tutorial "The Centroid of Convex Polygons" for an explanation on how to compute the centroid for convex polygons (the case of non-convex polygons is similar, more care has to be taken when triangulating the polygon though). 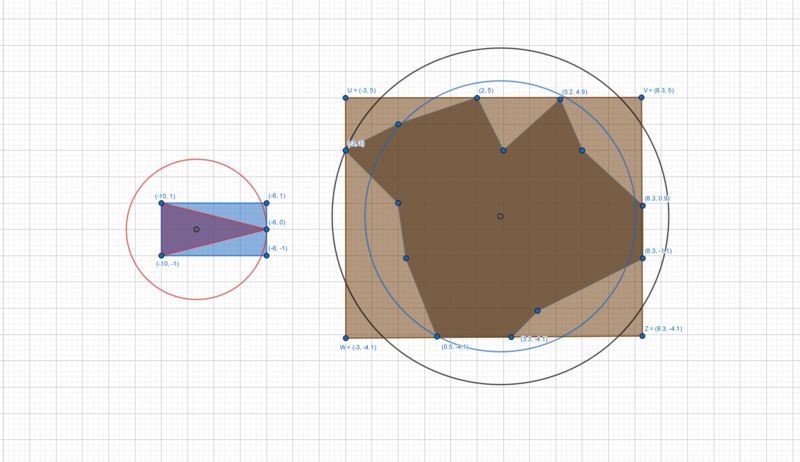 There are many choices for the radii, one can simply take the largest distance between the centroid of the polygon and its vertices (as in the figure above), one can take the distance of each vertex and average these radius, or one can just take some other heuristic. André LaMothe, the author of the book "Tricks of the Windows Game Programming Gurus"m mentions that he likes to use a value that is midway between the average and the farthest vertex. Let us try that out: The average distance for the above asteroid is $4,63$ and the largest distance between the centroid and a vertex is $6,4$, a number midway between the average and the largest distance would thus be, for example, $5,15$. The preferred heuristic of André LaMothe. The pilot managed to bring the aicraft to a halt before it crashed against the asteroid, but the bounding spheres still reported a collision. Poor pilot. Even though the cockpit is destroyed, the "LaMothe" heuristic reports no collision. Lucky pilot! Bear in mind, however, that on earlier hardware, the square root computation took a lot of time. If you want to program a game for older hardware, have a look at the "Fast Approximate Distance" article, by Rafael Baptista, which explains how to approximate the square root function by a linear combination of the minimum and maximum functions. 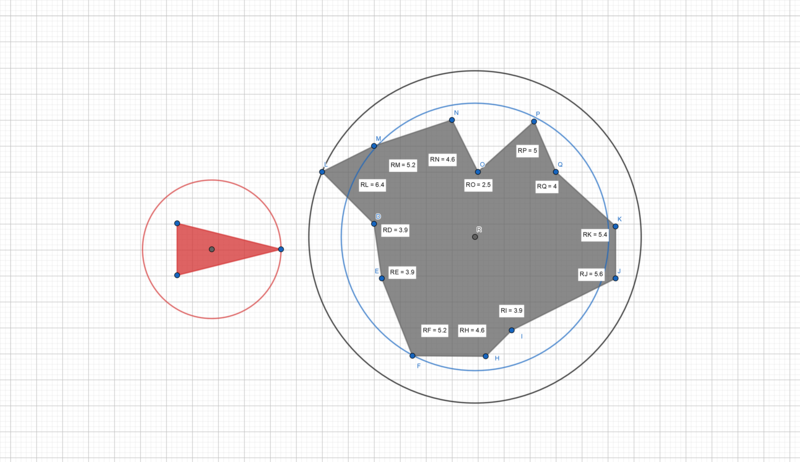 Checking for collisions is now as easy as testing a single equation: Let $d$ be the distance between the centroids of two polygons and $r_1$ and $r_2$ their respective radii, then the two polygons collide if, and only if, $d \leq (r_1+r_2)$. 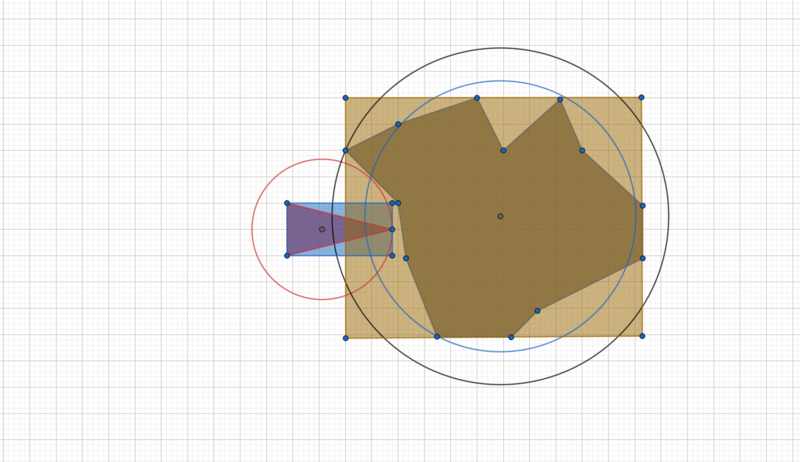 Bounding boxes around polygonal game objects. The lucky pilot managed to stop his aircraft before it collided with the asteroid. 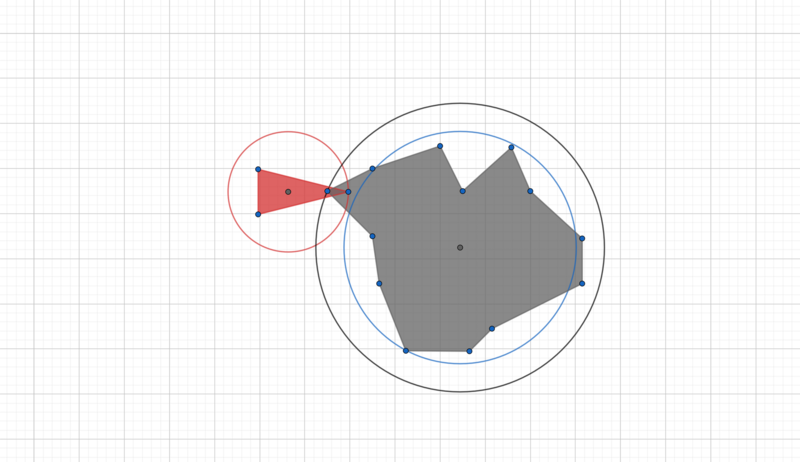 Even though the pilot parked his ship just above the asteroid, the bounding box algorithm shows no mercy! Thus to detect collisions with bounding boxes, it would now be sufficient to, for example, test any of the four corners of a box against another bounding box, or, if time permits, by using more clever methods. We won't cover any of these in detail, however, until in a later tutorial.